I don't watch much TV with the exception of NCAA and NFL Football, but recently I have found myself watching Shark Tank whenever I get a chance. I really enjoy seeing the innovation of the entrepreneurs and the dynamic between the investors. After watching a few episodes, you start to see a few tendencies in some of the investors. Anecdotally, it seems Robert Herjavec gives the entrepreneurs closest to their asking offers while Daymond John seems to pursue more equity than others. Then, there's "Mr. Wonderful" himself, Kevin O'Leary, who prides himself on being a "shark." 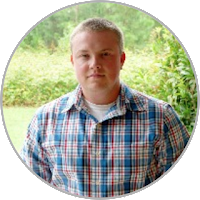 Kevin is infamous for his treatment of the entrepreneurs, but is he really the biggest shark in the tank? To answer this question, I needed to find data. 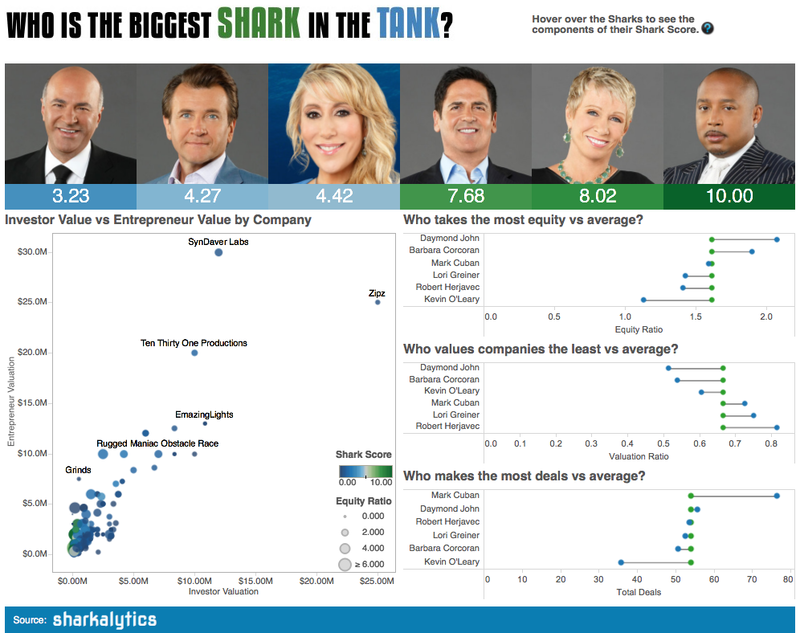 Luckily, I found an awesome site called Sharkalytics that tracks Shark Tank data from the episodes. After I found the data, I started to think about what components and metrics would be needed in order to quantify how much of a "shark" the investors really are. I started to think about what really appears to make an investor seem shrewd. First, a "shark" would pursue more equity than the entrepreneur offered. Second, a "shark" would pursue a deal with the intention of purchasing the company for less than asking price. Finally, a "shark" would be willing and aggressive in regards to making multiple deals. Using these components, the Shark Score was created. Deal Equity to Pitch Equity ratio: This identifies how much equity was obtained by the investor relative to what the entrepreneur offered. Deal Valuation to Pitch Valuation ratio: This ratio identifies how much the investor valued the business relative to what the entrepreneur valued it. Total Deals Made: This is simply the count of total deals made. The scores are then bound from 0-10 using a correction factor based off of the maximum Shark Score. The top Shark Score receives a 10. Now that I had the Shark Score worked out, I started to visualize the data using Tableau. I saw a cool article by Andy Kriebel on creating DNA charts using Tableau, and I thought this would be perfect for visualizing the Shark Score components. Using Andy's tutorial, it was fairly easy to create the charts I needed. Since Tableau 9.0 supports level of detail calculations, it was very easy to create the points for the average. I just needed to exclude the Investor level of detail and plot the point for the average. Once you put all three components together, you start to see Daymond John stand out as a "shark." He takes the most equity of any investor, values the companies the least compared to average, and makes the second most deals. For this reason, Daymond scores the max possible Shark Score of 10 and gets the title of "Biggest Shark in the Tank." Barbara Corcarand is a close second as she takes the second most equity and also values the companies the second least. It's also notable that for all of his insistence on being a shark, Kevin O'Leary takes the least equity of any investor and values the companies close to average. 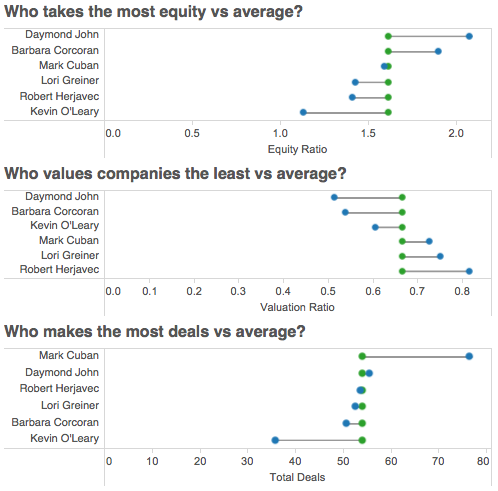 Kevin also makes the least amount of deals, so he actually has the lowest Shark Score of any investor. As Kevin would say, "The numbers don't lie", and in this case, he's not as much of a "shark" as he claims. Very cool, thank you for sharing. Is there a way to incorporate royalties into the analysis. O'Leary in particular loves to minimize his risk by offering royalty deals. Yeah, Kevin does rely heavily on royalties. In the data set that I had, it was too difficult to quantify Kevin's royalties since it was all in text descriptions. I might revisit it eventually.